This paper contemplates the curious employment of the “Merry Widow” waltz in the soundtrack of Hitchcock’s early American classic, Shadow of a Doubt. Occurring firstly during the opening credits and then at crucial moments during the unfolding story, and neither simply diegetic nor non-diegetic, this melody and the brief, hallucinatory scene of waltzing couples that sometimes accompanies it present a conundrum to the spectator/auditor about how to attribute their occurrence in the film. Through its name, the tune alludes to the secret identity of Uncle Charles (Joseph Cotten) as the “Merry Widow” serial killer of rich widows, on the run from a nationwide police hunt. But while the tune and the waltzing couples appear on one occasion in a lap dissolve over a shot of Charles, the film’s narration does not unequivocally mark this image-sound set as coming from ‘inside’ Charles’ head (there is nothing like a close-up shot of Charles looking off-screen as if imagining or recalling the tune or image). Rather, the film primes the viewer to understand their occurrence as a further manifestation of the telepathy between Charles and his favourite niece, Charlie (named after him). Against the better judgement of most critical accounts of the film, which prefer to interpret its use of the “Merry Widow” tune differently, I wish in this paper to consider the film’s insistence on the telepathic passage between heads – between the heads of two characters that Hitchcock has said (in his interview with François Truffaut) were conceived of with the figure of the double in mind. (1) He also indicates in that interview his concern to portray a telepathic relation between the two Charlies in a comment that Truffaut fails to interrogate further. (2) I wish to pursue the course of this interrogation by considering the enigma posed by the relation between the two characters that is made visible and audible in the dancing couples image/sound set, though in ways that are not the same for the spectator and the characters within the film. As Bill Rothman rightly says in his extensive and subtly inflected reading of the film, the image of the ballroom dancing couples appears over the opening credits of Shadow of a Doubt as if to announce an enigma that the film will pose and explore. (3) In the terms of Rothman’s auteurist engagement with the film, this enigma is intricately bound up with Hitchcock’s ongoing thematic and aesthetic concerns, concerns which Rothman articulates elaborately in his careful meditation on the film’s unfolding story about a psychotic serial killer hiding from the law inside the sanctuary of a ‘normal’ family (that of his sister) in a ‘normal’ American small town. 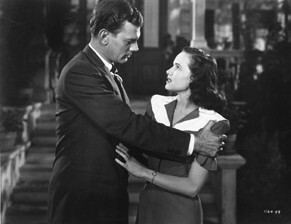 The dramatic trajectory of the film centres on the close relationship between the killer, Uncle Charles (Joseph Cotton), and his niece and namesake, Charlie (Teresa Wright). I do not wish to dispute Rothman’s claim about how to read the image of the dancing couples, or rather the conjunction of this image with the sound of the “Merry Widow” waltz with which it is always heard in its four appearances in the film. Nor do I wish to argue for the superiority of an alternative reading to any of the other numerous interpretations of the dancing couples I have come across in my research (some of which I will refer to). Rather I wish to suggest another level at which the enigma operates as enigma, one which, like the image of the dancers itself, is encountered before the many other ways the image signifies and remains after they have been taken into account. While the “Merry Widow” ‘image-sound set’ is not clearly coded as arising from inside Uncle Charles’ head-there is, for instance, no close-up of Charles looking off-screen which unequivocally signifies that this image should be taken as a recollection of his, or as an image from his imagination-it does appear here over a shot of Charles. The film’s dècoupage and script work together to explain it as a kind of telepathic communication between Uncle Charles and Charlie. (5) Confirmation that the message has been sent and received is found in the fact that on the other side of the bridging dissolve Charlie is already humming the tune of the “Merry Widow” waltz. Charlie says that she can’t get the tune out her head and that she believes that ‘tunes jump from head to head’. All this recalls an earlier scene in which Charlie goes to the post office in order to send a telegram to Uncle Charlie only to discover a telegram from him is waiting to be picked up. Delighted, she proposes the existence of ‘mental telepathy’ to a sceptical postal worker who initially confuses telepathy with telegraphy and then replies by saying that she only knows how to ‘send telegrams in the normal way’. Charlie describes telepathy as a communication that is ‘all mental’ which relies on the fact that certain people are ‘in tune’ with each other. Taken together with the postal worker’s comments, this dialogue evokes what Joe Cooper has described as the most common model of telepathy in the modern, ‘electronic’ age: ‘that of the sender as a kind of transmitting station and the percipient as some form of receiver analogous to a radio or television set’. (6) The “Merry Widow” tune enacts a curious pun that plays on this metaphor of the telepathic ‘tuning in’ that itself figures the mysterious connection between Uncle Charles and Charlie. The dancing couples image is a visual presentation and extension of this associative, punning procedure: from telepathic ‘in tuneness’ to the waltz tune to the image one would associate with it, ballroom dancing. The narrative motivation for the use of the “Merry Widow” tune, both in concert with this image and as a key motif throughout the film’s musical score, arises from the newspaper sobriquet which names the fugitive serial killer through his target victims by reference to the popular waltz. The waltzing couples image figures Charles’ secret, namely, that he is the ‘”Merry Widow” Killer’. It is the tune itself, however, that threatens to blow Uncle Charles’ cover, for this is what is passed ‘from head to head’ and pops into Charlie’s head after the ‘betrothal sequence’ (and later into Emily’s). It is also what has passed from the extra-diegetic realm of incidental music and transitional devices such as the dissolve into the fictive world of the film, a move which proves decisive in aiding Charlie in her quest to uncover Uncle Charles’ ‘wonderful secret’. The image of the waltzing couples does not seem to be a vision belonging to any character in the film. Its appearance over the credits before the film’s story begins supports this view. Unlike the “Merry Widow” tune itself, it appears to be superfluous to the progression of the film’s plot. This intellectual feeling of thirdness is that conveyed by the mental image which ‘finds its most adequate representation in relation’ (p. 197). The waltzing couples image represents the mysterious relation between the strangely doubled characters of Uncle Charles and Charlie. Their doubling plays out all the classic trajectories of the figure of the double: the dizzying play of resemblance (the telepathy, the visual rhymings of their initial presentation in the film, the ultimate sharing of a murderous intent), and the desperate duel of difference (Charlie’s desire to avoid complicity with Charles’ deceptions, her struggle to maintain her Santa Rosa against Charles’ vision of the world). The looped image of the couples dancing, each pair resembling the others, the couples moving in circles, all this emphasises the duel of the double that drives the plot forward. At the same time, however, it is a mental image of the relation between the two Charlies, of an invisible ‘thirdness’ which allows the double to become manifest just as the ‘one-two-three, one-two-three’ of the dancer’s unseen steps propels them along together in the waltz. This three-step determines the continuous movement of the couples almost imperceptibly, mirroring the invisibility of the relation between Uncle Charles and Charlie that cannot enter the film world. It cannot enter it, that is, except as the enigma of the telepathic link, an enigma which rebounds on young Charlie so severely that at the end of the film she is at a loss to comprehend the ‘wonderful secret’ she eventually discovers inside Uncle Charles and the mystery of their mutual resemblance. I would like to conclude this meditation on the dancing couples image by suggesting that, even before it represents in a mental image the strange relations between characters within Shadow of a Doubt, this image-sound set presents the enigma of relation per se, of the power of images and sounds to associate different things, to create relations of the kind described by Deleuze, and analysed by all those others drawn to interpret the film’s significance in various ways. The modern metaphor for mental telepathy which the film’s script promotes explains the image of the dancers (and the communication between heads of the “Merry Widow” tune which the dancers visualise) in the terms of the electronic media of radio and televisual transmission. The ‘transmitted’ image, however, appears to be long past, or coming from some timeless zone of a ‘looped’ perpetual present. Either way, this capacity to associate image and sound and create an audio-visual link between the heads of characters in the film and between the film and the heads of its spectators appears at this level as an inaccessible and unsolvable mystery, one which nevertheless is the source of the modern ‘telepathy’ of electronic media and in particular, the cinema. This telepathic relation between the two Charlies ends in death, but at the film’s conclusion the resolution of the conflict between them is haunted by the final return of the waltzing couples to connect the scene of Uncle Charles’ demise to that of the ‘pyrrhic victory’ of young Charlie. Her passage to womanhood and marriage with the clean-cut, uncomprehending detective, Graham (Macdonald Carey), is ghosted by the enigma of the relation in and through which Hitchcock’s telepathic apparatus has given her to the spectator. François Truffaut, Hitchcock, London, Secker & Warburg, 1968, p. 166: Truffaut: “This picture [Strangers on a Train], like Shadow of a Doubt, is systematically built round the figure “two”..” Hitchcock: “That’s right”. William Rothman, Hitchcock: The Murderous Gaze, Cambridge, Mass. Harvard Univ Press, 1982, p. 179. Intriguingly, the initial appearance of the dancing couples image in the film’s credits bridges the gap between credits and ‘film proper’ by means of a dissolve over a shot of a bridge which is the first thing seen in a series of shot transitions that takes us to Uncle Charles via a montage of the degraded urban milieu from which he flees at the film’s outset. In terms of the bridging pattern described here, there is a significant variation in the final appearance of the dancing couples image. The image (along with the tune) appears over the shot in which Uncle Charles falls to his death at the film’s climax. It persists over the first image of a series of transitional shots similar in pattern to that of the film’s opening. They represent a montage of the public funeral procession in Santa Rosa for Uncle Charles and end on a view of young Charlie sitting outside the funeral. The relationship of the waltzing couples image to death is marked here in a film where death is a crucial if somewhat submerged theme. In this regard I note Roger Hillman’s acute observation (in personal correspondence) that one of the waltzing ladies is wearing black, and that inasmuch as they appear mostly in a transitional, ‘dissolved’ mode they are a ghostly half-presence in the film’s image track. The question could be posed as to whether the communication is ‘from’ Charles? As a gesture toward an alternative meditation on this sequence, and on the question of the telepathic relation in play in the film, let me propose two alternative responses to this question, each of which indicates supplementary considerations not adequately pursued in the limited scope allowed for this paper. a) In view of the fact that he does not wish to give up his secret, it would not be an intentional communication from Charles. It may be a message sent inadvertently and picked up by via young Charlie’s telepathic facility. As such it could be understood as the seemingly miraculous result of what Interactionist Sociology calls an ‘unfocused interaction’ between parties. The term is Erving Goffman’s, and as Gilles Deleuze has pointed out in Cinema 2: The Time-Image this kind of sociological theory was developed by Goffman and others in order to account for modern forms of urban social relations and ‘the problems of information, of circulation of information’ (Deleuze, p. 321, n. 6, and Erving Goffman, Encounters: Two Studies in the Sociology of Interaction, Indianapolis, Bobs-Merrill, 1961, p. 8). Such phenomena as the spread of rumours or ‘a song which crosses places, spaces and people’ are of particular interest to interactionist sociology inasmuch as they indicate a novel process whereby the ‘continuous circulation, propagation and autonomous evolution’ of a ‘speech-act’ create interactions between people not otherwise connected as individuals in socially structured situations (Deleuze, p. 227). While this telepathic interaction occurs between two individuals connected by familial ties, their interaction here is nonetheless an unfocused one because it is not the result of a focused and pre-established framework of interchange (such as the family dinner or the giving of gifts in which they are engaged at this moment; see Goffman p. 8). This reading of the dancing couples image as a figure of a peculiarly modern form of unfocused communication is relevant to the thesis to be outlined in the course of this paper, namely, that the image, taken as a sign of a mysterious telepathic link between the two Charlies, visualises the enigma of mediation in the electronic age of the transmission of image and sound across spatial and temporal ‘distances’. b) Or is this communication from elsewhere? There are grounds for arguing that the dancing couples image ‘comes from’ the dead widow whose ring Uncle Charles has just given to young Charlie, Thelma Schenley, the ‘TS’ engraved on the ring which Charlie immediately notices. The Merry Widow tune is heard on the soundtrack at the moment Charlie discovers the engraving on the inside of the ring. It is this discovery that ultimately leads Charlie to uncover Uncle Charles ‘wonderful secret’. If Charlie is telepathic, perhaps she is also (or alternatively) clairvoyant, able to pick up communications from beyond the grave. This would make the dancing couples image an unexpected gift, one which doubles the ostensible gift of the ring (and both skewing and intensifying the betrothal or ‘coupling’ that the ring implies). Whether ultimately it is taken as a gift from Thelma Schenley or from Uncle Charles’ consciousness of his murderous appropriation of her capacity to give away her ring, the gift is associated with death, it is to be the death of her dangerous coupling with Uncle Charles. It cannot be understood by young Charlie as a gift even if it appears indirectly and retrospectively to have given her the vital clue via the “Merry Widow” tune. As such, this image-sound set invites consideration in terms of Jacques Derrida’s theory of the ‘true’ gift which would, he argues, never be reducible to the conventional ‘economy’ of gift exchange and would thus never be recognisable as a gift. ‘The simple recognition of the gift seems to destroy it’, says Derrida in Given Time: 1. Counterfeit Money, trans. Peggy Kamuf, Chicago, Univ. of Chicago Press, 1992, p.14. This is because a gift, to be truly a gift, would need to exceed all the networks of exchange, gratitude, indebtedness etc. in and through which gifts routinely operate and take their significance in human culture. Such a gift is in a sense impossible, paradoxical, because it could never be recognised, remembered, or thought of as a gift. These cognitions of the gift insert it in a temporality of exchange and signification and communication. The ‘true’ gift eludes this ‘temporalisation of time (memory, present, anticipation; retention, protention, imminence of the future; “ecstases” and so forth) [which] always sets in motion the process of a destruction of the gift: through keeping, restitution, reproduction, the anticipatory expectation or apprehension that grasps or comprehends in advance’ (p. 14). The waltzing couples/”Merry Widow” image-sound set is, perhaps, such a gift from the non-temporalised time of death for young Charlie, if not for the spectator who is given it as an enigma from before the film’s beginning. Joe Cooper, The Mystery of Telepathy, London, Constable, 1982, p. 168. James Naremore, ‘Hitchcock at the Margins of Noir’, Richard Allen and S. Ishii-Gonzales (eds), Alfred Hitchcock: Centenary Essays, London, BFI Publishing, 1999, p. 274. Ronnie Scheib, ‘Charlie’s Uncle’, Film Comment, v. 1, n. 2, March/April 1976, p. 58. Elisabeth Weis, The Silent Scream: Alfred Hitchcock’s Sound Track, London, Fairleigh Dickinson University Press, 1982, p. 102-103. Roger Hillman of the Australian National University has also discerned a complex interweaving of snatches of a waltz by Ravel and one from Richard Strauss’ Der Rosenkavalier along with the “Merry Widow” melody in the opening credits sequence, further substantiating Weis’ thesis about the thematic resonance of Tiomkin’s score with a late nineteenth century nostalgia (from personal correspondence with Roger Hillman). Gilles Deleuze, Cinema One: The Movement-Image, trans. Hugh Tomlinson and Barbara Habberjam, Minnesota, Univ of Minneapolis Press, 1986, p. 197.